"35-year-old PhDs who love to talk, because that's the way you let everybody know how smart you are, is how much you talk." 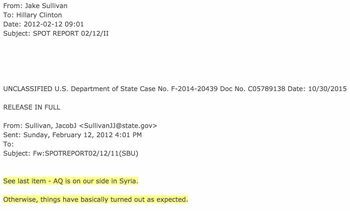 During the Arab Spring uprisings, Sullivan emailed Clinton saying "Al Qaeda is on our side!" [Secretary Clinton] has been a critical voice on Libya in administration deliberations, at NATO, and in contact group meetings — as well as the public face of the U.S. effort in Libya. She was instrumental in securing the authorization, building the coalition, and tightening the noose around Qadhafi and his regime. A week earlier Sharia law was enshrined in the new draft Libyan Constitution, and CBS News reported the indiscriminate killing of black people by US backed "Libyan rebels". After the 2016 Presidential election Sullivan took the lead along with Clinton Communications Director Jennifer Palmieri in briefing the press on the Trump-Russia collusion story. ↑ Sec. Chuck Hagel continues, "[Obama] has a staff around him that's very inexperienced. I don't think there's one veteran on his senior staff at the White House. I don't believe there's one business person. I don't believe there's one person who's ever run anything. Other than Vice President Biden, none of them have ever been elected to anything." Sec. Robert Gates criticized "staffers calling senior commanders out in the field and asking them questions, of second guessing commanders...I told my combatant commanders and field commanders … if you get calls from … the president, that's one thing. But if you get a call from some White House or National Security Council staffer, you tell them to call me instead, and then tell them, by the way, go to hell." Hagel also criticized Susan Rice's approach and subservience to Obama. This page was last modified on 9 April 2019, at 10:38.